Your child’s showing all the signs of being ready to potty train. That’s great! But now where do you start? Decide whether or not you’re going to use pull-ups, training pants or regular underwear and try to stick with this decision so your child has consistency and isn’t confused. Think about whether or not you want to use rewards or not. Figure out a strategy on how to handle potty issues when you’re away from home. If your child is in child care, ask your provider for their advice and make sure there aren’t any hard and fast rules the center or caregiver has in place that may be an issue. Let them know that you’re going to start and enlist their help with the process. Praise your child for each successful trip to the potty, and comfort them when accidents happen and try to remain patient and calm when they do. Avoid using candy or other treats as reinforcement. Let them know that it will take a while to get the hang of using the potty, and encourage and praise each attempt they make. With consistency, encouragement and praise, they’ll soon be completely trained. Toilet Training in Less Than a Day From two noted learning specialists, here is the amazing, scientifically proved Azrin-Foxx method that teaches potty training quickly—in less than four hours for the average child. The classic guide used by millions of parents! 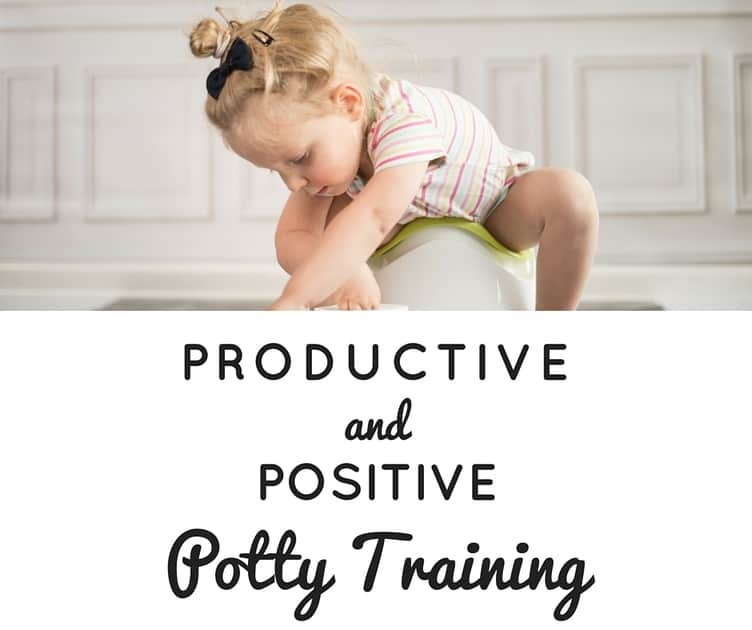 Make potty training a total success—in only a few hours! After that rewarding learning period, he or she will willingly use the toilet without assistance or a reminder! Happy children, happy parents—how mastering potty training benefits the whole family, increasing parents’ personal time and deepening the parent-child connection. With more than 2 million copies sold, Toilet Training in Less Than a Day is the one guide you’ll need to make this significant transition a rewarding and pleasurable experience—for both you and your toddler! The Happiest Toddler on the Block: How to Eliminate Tantrums and Raise a Patient, Respectful, and Cooperative One- to Four-Year-Old Perfect for expecting parents who want to prepare themselves for the challenging toddler years (which starts around eight months of age), this essential guide, a national bestseller by respected pediatrician and child development expert Dr. Harvey Karp, not only helps reduce tantrums but makes happy kids even happier by boosting patience, cooperation, and self-confidence. This streamlined revision of the breakthrough bestseller by renowned child-development expert Dr. Harvey Karp will do even more to help busy parents survive the “terrible twos” and beyond…. In one of the most revolutionary advances in parenting of the past twenty-five years, Dr. Karp revealed that toddlers often act like uncivilized little cavemen, with a primitive way of thinking and communicating that is all their own. In this revised edition of his parenting classic, Dr. Karp has made his innovative approach easier to learn—and put into action—than ever before. Combining his trademark tools of Toddler-ese and the Fast-Food Rule with a highly effective new green light/yellow light/red light method for molding toddler behavior, Dr. Karp provides fast solutions for today’s busy and stressed parents. As you discover ways to boost your child’s good (green light) behavior, curb his annoying (yellow light) behavior, and immediately stop his unacceptable (red light) behavior you will learn how to soothe his stormy outbursts with amazing success—and better yet, prevent these outbursts before they begin! And the new thirty-item glossary of Dr. Karp’s parenting techniques will save you valuable time when you need to instantly calm an out-of-control child. The result: fewer tantrums, less yelling, and more happy, loving time for you and your child.